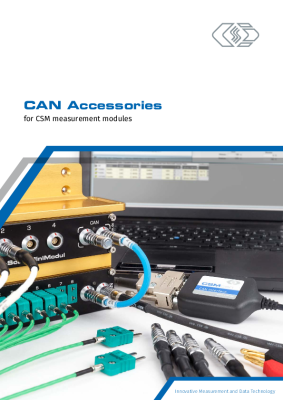 Safe acquisition of analog signals on high-voltage components: CSM’s HV AD measurement modules offer all-round measurement technology for sensors with analog voltage outputs or measurements of analog voltages up to ±90 V in high-voltage environments. 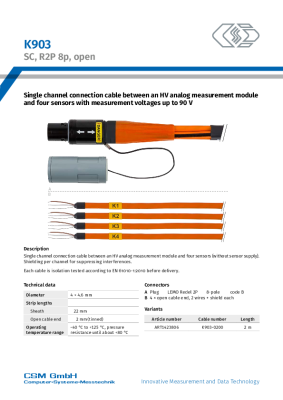 Specifically designed to be operated in high-voltage environments, HV AD4 OW1000 measurement modules, equipped with 4 analog inputs, provide safety for analog voltage measurements. 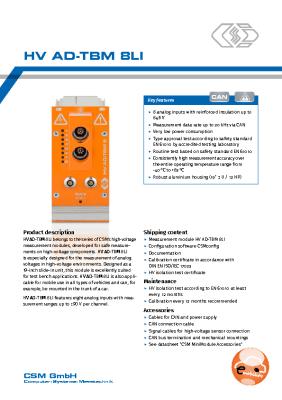 HV AD4 XW20 measurement modules are specifically designed for the measurement of high voltages in high-voltage environments. Designed as 19-inch slide-in units, they are excellently suited for test bench applications and rack installation in enclosed areas of a vehicle. E-mobility: Safe measurements on high-voltage components of electric and hybrid vehicles; in distributed applications and in test benches. CSM measurement systems offer certified safety for the measurement of temperature, voltage, humidity, etc. 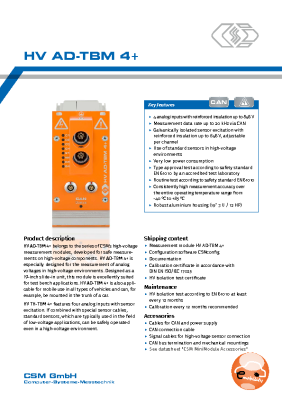 in high-voltage environments.